It may seem very obvious, but your pond liner needs to cover the whole ground area of your pond, not just the surface area of the hole you are going to dig. So, how do you know how much pond liner you need? 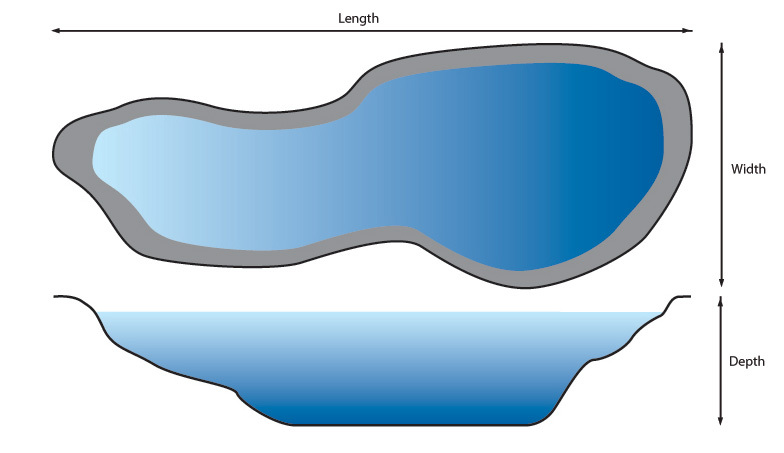 We’ve tried to make it simple using our rule of thumb pond liner calculator below, which will provide you with a guide to the size of pond liner you will need. The exact size you require will depend on the fixing method you choose to use in your pond. We would recommend you measure the contours of the pond after excavation (a piece of string works well for this), including extra for fixing to ensure you have the correct amount of liner. Type your measurements into the boxes below and we will calculate the minimum pond liner size for you. You can find a pond liner calculator on all our pond liner product pages to help you when ordering. Please note: For larger projects (lakes and reservoirs) we recommend taking more accurate measurements in order to reduce waste. After excavation, the area should be measured following the contours of the pond along the greatest width and greatest length, with allowance made for anchor trenching or other liner fixing. If you need any help measuring your pond or with the pond liner calculator, please contact us and we would be more than happy to give you some advice.